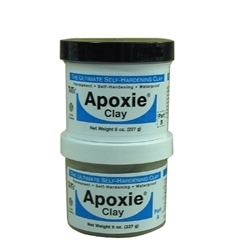 APOXIE CLAY is a self-hardening, permanent, waterproof clay that is most commonly used for a matte finish when a “shiny” APOXIE SCULPT finish is not desirable. One (1) hour working time with a setting time of two (2) hours. Accepts paints and cleans up with water.